1. Join us on the evening at the dinner itself; the suggested level of voluntary donation is £110 per person / £220 per couple, and there will be an appeal on the night. To reserve your seat, please contact Dr Veronique Berman or Britt Jacobs by email at rsvp@hasmonean-pri.barnet.sch.uk. 2. Advertise or place a greeting in the dinner brochure, or sponsor one of the items available. Click here to download the brochure form or email rsvp@hasmonean-pri.barnet.sch.uk. 3. If you are unable to attend, perhaps consider making a one-off donation to the school instead or placing an advert in the brochure in any case. We are delighted to be able to share with you news on how you can participate in and be involved with our forthcoming school fundraising dinner. As you are aware, financial cuts by national and local government mean the pressure on schools is only increasing. Over the coming few years, these cuts are going to hit particularly hard, meaning difficult choices will have to be made about how we operate and allocate our resources. Whilst we are planning to manage this within our existing budget, it does mean that any further improvements to the physical building or additional teaching resources in the classroom has to come from funds raised by the Governors, through PTA activities or from the parent body. 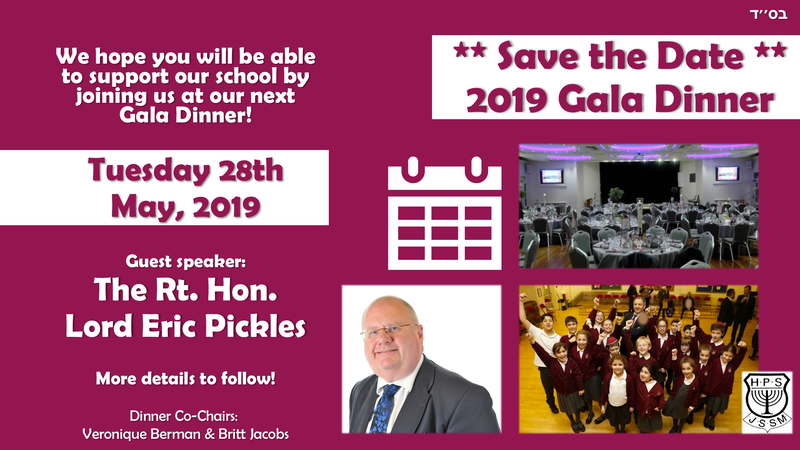 With this in mind, we are holding a second Gala Fundraising Dinner on Tuesday 28th May 2019 and are delighted that Lord Eric Pickles will join us as our guest of honour. Throughout his career, Lord Pickles has been a wonderful friend to the Jewish community in the UK and a passionate supporter of the State of Israel. A former Secretary of State for Communities and Local Government, Minister for Faith and chairman of the Conservative Party, Lord Pickles is currently the chairman of the Conservative Friends of Israel and serves as Her Majesty’s Government’s Special Envoy for Post-Holocaust Issues. He is certain to provide a very interesting perspective on the UK and the world! We wanted to highlight three ways in which you can support the school and ensure our children continue to receive the best possible education, in the best possible teaching environment. Whilst we were delighted with and proud of our recent Ofsted report which noted how Hasmonean is a “high attaining school where pupils enjoy their learning”, we know there is a huge amount still to do to ensure we continue to grow and our children continue to flourish. Thank you for considering helping us to achieve this goal. p.s. If you want to take a look at highlights from our 70th anniversary fundraising dinner, held in February 2017 when our speaker was Rabbi Lord Sacks, please click here.